Today I got a question via twitter about my motivation to be an industrialist about good things as indy in a corp and about worst things. To be honest, my view of manufacturing and trading have changed the last year. But first things first. I started my eve career like most others.. in highsec..mining.. all that stuff. Our corp had a pos and some of my “older” mates were running some ME/TE jobs. So I started to get some information about all the industrial stuff. One reason was, I really like to create things. Crafting was always a thing for me. And there were so much ways for perfection, which triggered me also. I hadn’t that much ISK at that time.. around 500mil ISK maybe and I talked to some experienced players about how to get more ISK. This was the moment, where I started my trading stuff. That was the time of great spreadsheets also and I made my first 10 bil really fast. But it was a boring thing (I gave up trading the small stuff today). I invested the new ISK to start my manufacturing career (that was before the great manufacturing changes). And with the help of the corp pos, there were enough possibilities to make money with manufacturing also, but the really big money came after I trained for T2/T3 invention and manufacturing. At that time I had 3 or 4 chars running inventions and manufacturing jobs 23,5 hours a day. The good thing on manufacturing (and invention) is: you don’t have to be that active. Yes, you have to plan your jobs, but besides let RedFrog haul your stuff. The jobs will run without you most of the time. Yeah there some risks, like wardecs, but you should have friends in case you need help. (more on that later). Shortly after that, I started to PVPing with my main, and let my alts run the industrial stuff. I’m not that active in highsec anymore and there are times, where the POS is just burning fuel doing nothing ;). Today, I could build up nearly everything, if i want and can create up to around 10billion a month, if needed, but this would need more time to invest in manufacturing and planning. As you see, I evolved a bit. Today I run my manufacturing alts to create enough ISK for my PVPing and to support some friends with ships, modules and so on. Maybe my focus will change a bit after the next expansion. Maybe I will move my industrial part to low or nullsec to build something new, but maybe I just use the new opportunity to use more ressources to pvp. To talk about the industrial in corps: it depends. Is it an industrial corp or a pvp corp with an industrial wing? One of the problems with manufacturing is: the more ppl manufacture in your systeme, the less isk will you get, thanks to the index. Another one is: normally you want to optiminze your ISK flow, so many industrialists are lonewolfs and don’t want to build for corp for example. And with the rights management atm, you have to risk your assets to grant access to other corpmates. so it’s not that easy to be an industrialist in a corp.
An important Thing is: have friends! One of the things I learned the last years. If you are an industrialist in highsec, there will be wardecs. This is no bad thing. You shouldn’t fear wardecs. Just have friends to help you.. to move stuff, to haul and the most important: to defend your stuff. To be honest. If a war results in blowing up ships: good for me as industrialist, because I can build them and make my cut. 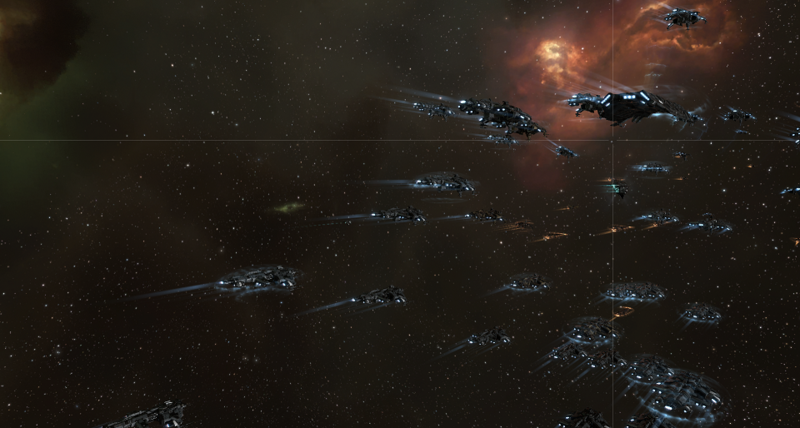 And it is fun to surprise some lazy wardeccers with a prepared fleet. If you don’t have enough friends.. hire some TRUSTWORTHY mercs.. the worst thing you can do (as lonewolf or as corp) is.. to avoid conflicts, to give up. Go and train your PVP skills. Yeah, you will loose a lot of ships, yeah there will be times, you are frustrated, but this will help you a lot at that times. And it is so much fun. You will shoot some awesome ppl. Some awesome ppl will shoot you.. and if you end up in a good talk after it or (what is my favorite) you will have some drinks with them at one of the great player gatherings.. you will have a great time. Ich muss jetzt mal ein bisschen Werbung machen. 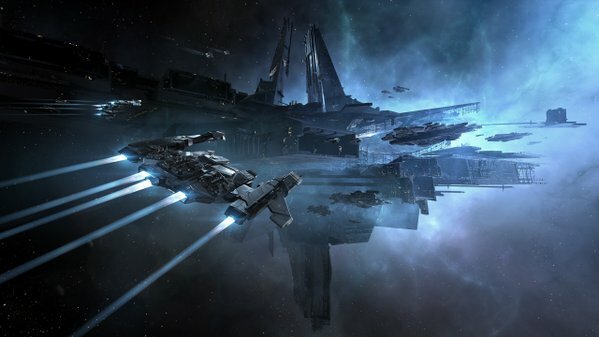 Nicht nur für Eve Online (das meine werten Leser vermutlich eh spielen), sondern insbesondere dafür, die gewohnte Sicherheit des Highsec zu verlassen und sich einer Corp/Allianz anzuschließen, die PvP macht. Welche Form des PvP’s ist letztlich eure Sache. Ich empfehle jedoch Faction Warfare. Doch erstmal zu dem, wie ich dazu gekommen bin. Als ich mit Eve gestartet bin, ging es mir wohl wie den meisten anderen. Ich hatte keine rechte Vorstellung, was ich machen soll, also habe ich getan, was alle in der Corp getan haben: Missionrunning und Mining. So habe ich also das erste Jahr verbracht. Ich habe dann auch in weitere Dinge reingeschnuppert. PI im Wurmloch, Sites fliegen im Wurmloch, Stationtrading, Industrie, 0.0. Einiges davon mache ich auch heute noch mit meinen Alts, aber nicht mehr als Hauptthema. Mein Main befindet sich seit einigen Monaten im Gallente Faction Warfare. 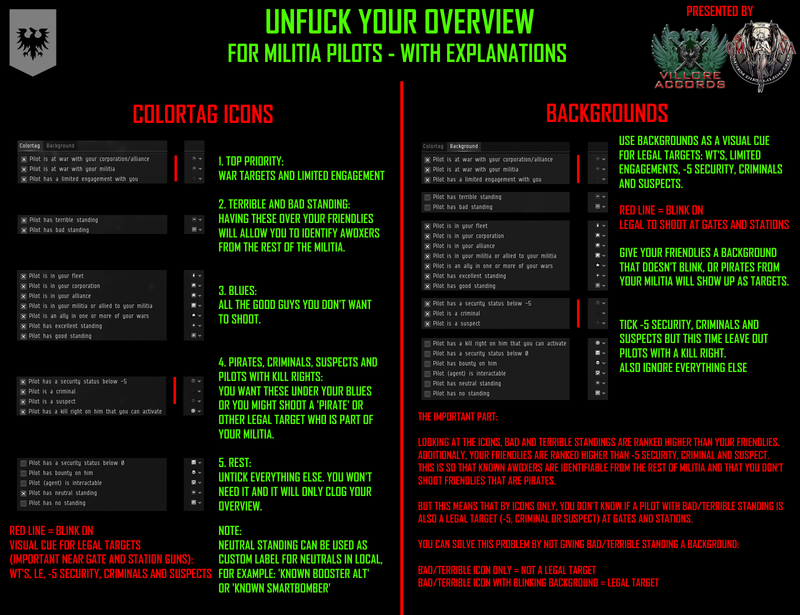 Bei Faction Warfare, also dem Krieg der Fraktionen (Amarr <-> Minmatar, bzw Gallente <-> Caldari) schließt Du dich quasi einer der Fraktionen an. Das hat verschiedene Auswirkungen. Du kannst nicht mehr so ohne weiteres in den Highsecraum der gegnerischen Fraktion. Du befindest Dich quasi im Dauerkrieg. Auslöser für uns war, dass der harte Kern der Corp keine Lust mehr auf Highsec hatte. Jeder von uns hatte mehr oder minder sein Intermezzo im PvP erlebt. Wir waren des Minings müde geworden. Also ging die Suche auf eine geeignete Heimat los. Gallente Faction Warfare war ziemlich bald als Ziel ausgemacht und im eveger-forum entdeckte ich das Gesuch von HildCo , eine Deutschsprachige Gallente FW Corp, die wiederum zur berühmten Allianz Villore Accords (GMVA) gehört. Nachdem wir das gelesen hatten, dauerte es nicht lang, bis wir zum Bewerbungsgespräch auf dem TS landeten. (Fast) jeden Tag Flotten, ohne Zwang daran teilhaben zu müssen. Also schaut bei uns rein. Schließt euch einer Corp der GMVA an. Egal ob ihr Anfänger oder Alter Hase seid. Helft uns den Caldari den Garaus zu machen und habt Spaß dabei. Ich kann euch garantieren. Ihr werdet es nicht bereuen. Wenn ihr nicht wisst, wen ihr ansprechen sollt, meldet euch einfach bei mir. Da sind sie nun endlich, die Citadel’s. Lange wurde drüber geredet bzw, drüber geschrieben, doch nun hat CCP mit dem Citadel Expansion den ersten Schwung released. Doch wurden die Erwartungen erfüllt? Citadel’s sind konzeptionell dazu gedacht, die Aufgaben von POSen und Stationen abzulösen. Hierzu musste der bisherige Gedanke, wie diese Strukturen verwendet werden natürlich berücksichtigt werden. Citadel’s als mächtiger Heimathafen, die als Basis für Corporations, Allianzen und auch als Freihafen funktionieren. Die auf Grund der neuen Vulnerabletimer auch “beinahe” sicher sind und zusätzlich Funktionen wie Clone Basis, Regionaler Markt etc bieten. Ein schöner Gedanke. Doch wie die ersten Tage zeigen, ist der vermeintliche Hafen zur Schießbude geworden und schießwütige Banden ziehen durch die Lande, sorry Systeme und erledigen Citadel für Citadel. Natürlich kann es erstmal daran liegen, dass es was neues ist und somit eine neue Herausforderung bietet, aber von der vorher noch heraufbeschworenen Vorstellung, dass die Systeme dann mit zig Citadel’s überall zugepflastert werden sind wir doch weit weg. Ich selbst werde vorerst den Teufel tun und mir mit der Alt-Corp so ein Ding sicher nicht ans Bein binden. Zumal es doch sehr unrealistisch ist, mit ein paar Mann so ein Teil zu verteidigen. Trotz des kleinen Vulnerable Fensters. Mein Corp + Bloggerkollege Jezaja hat diesen Aspekt in seinem Blogpost ja sehr schön beleuchtet. Werden POSen denn nun trotzdem obsolet und bildet sich dadurch ein Vakuum? Ganz klar nein, NOCH nicht. Eine POS sollte für die durchschnittliche Corp immer noch das Mittel zur Wahl sein. Schnell aufgebaut, schnell abgebaut und doch recht günstig. Besonders im Hinblick auf das Thema Industrie gibt es zur Zeit doch auch noch gar keine Alternative. Im Herbst könnte sich das ändern, wenn das Äquivalent für die Industrie erscheint. Auf dem Fanfest gab es ja schon einen kurzen ersten Ausblick. Ich bin gespannt, ob sich das dann für die kleineren Corps eher lohnt, oder ob sich hier ein Loch auftut und die Produktion ab dann größeren Entitäten vorbehalten bleibt. In diesem Sinne: Citadel’s sind das, was ihr draus macht. Seid ihr Opfer oder die Zerstörer der Sandburgen anderer, wie unten gezeigt? Yeah I know, I promised to be more active and to deliver more financial report’s, but several aspects were against me. First of all: The Division. To be honest, I really like settings like this. End of days scenarios are great. And I really had fun before all this falcon lost glitch/exploit thingies. Maybe I’m too old to see, why I should use exploits. I mean, what does it say about my skill? So, yeah. I played a lot The Division in the last weeks since release. Another timesink was my work, as always. There were several workshops all around europe, so I had to travel a lot. Much more than I expected before. Damn parental leave of two collegues. I really hope to have a bit more time yet until summer. Last, but not least several projects around Eve and some beside of it. I trained some alts to be part of the great Red-Frog logistics. I used it a lot, before and I will use it much more now. The Red-Frog guys are great. Some really nice player with lot of experience, how to haul (mostly) save. I also read and watched all around the Fanfest. It was a pleasure and I was really jealous not to be there. I promised to myself to fly to Iceland next year and already started to save some money for it. There some good summaries out there. Go and read all about the stuff that will happen this year. So all in all I had not that much time for my industrial stuff in eve. I have done some inventions and built some stuff. But that’s all. The result is: Not that much profit for the last months. Besides, I bought several skillbooks around freighters and capitals and some more expensive ships. 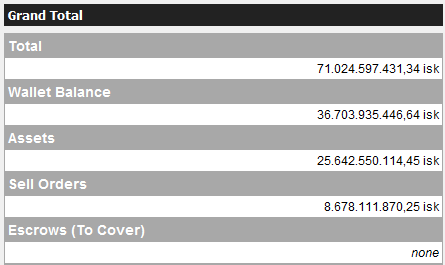 So I should have more ISK, but I was too lazy and wasteful. In faction warfare, everything is almost the same, as last time. I have flown some times with my alliance mates and really had fun with the Drunken Thrasher Fleets (TTT ;) ). The only thing, that make me sad, is the change of some of my old corpmates to another corp in the alliance, but I can totally understand why. Maybe I will change also in near future, but again. I need more time to play. I don’t want to be an inactive member at a corporation like this. Don’t hesitate to broadcast4reps. I can’t say this hard enough. You’re not alone. There people that have a good word for you. They’re listening. They try to help. No matter what. We are a great community. And Eve would be nothing without this community. It’s the heart and the soul. All the gaming shenanigans are nice and super fun. But the community behind them is, what keeps me playing. Conclusion for this entry: I will try to participate more at the alliance fleets (and eve in general). I plan to fly to the EVE Fanfest 2017. I need to figure out, how to combine my highsec and my lowsec activities. And last but not least: broadcast4reps, if you need help! 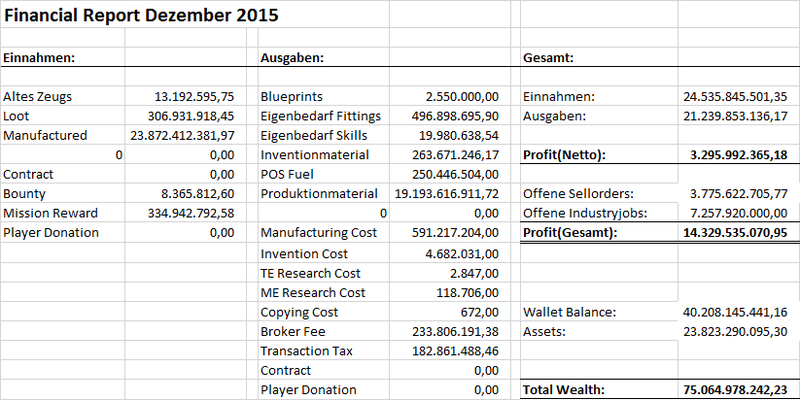 Financial Report – Diesmal abgespeckt. Wie man sieht, ist mein Gesamtvermögen ein ganzes Stück geschrumpft. Die verlorene POS, inkl Materialien und bissl Kleinkram, sowie das neu aufbauen der POS und natürlich ein paar kleinere Verluste beim FacWar machen sich dann doch bemerkbar. Insgesamt habe ich die Verluste zwar etwas ausgleichen können, aber es wird sicher noch einen Monat dauern, bis ich wieder auf dem Level von letztem Monat bin. Dann leiste ich doch auch mal meinen Beitrag zum Thema solo Abschuss im PvP. Es ist gar nicht so lang her und ich berichtete schon in einem der vorherigen Beiträgen davon. Ich bin ja seit kurzem mit meinem Main in Faction Warfare unterwegs und kämpfe an der Seite meiner GMVA Kollegen für den gerechten Sieg der Gallente. Genau, ich HighSec Noob betätige mich im PvP mit mehr oder minder akzeptablem Erfolg. Naja, kurz nachdem ich also HildCo beigetreten bin, um meinen Dienst zu leisten bin ich natürlich auch Todesmutig losgezogen, um in Plexen auf ahnungslose Opfer zu warten, die ich als Noob besiegen kann (und war schon voller Erwartung dabei kläglich zu scheitern). Aber, während sich der zweite Gedanke schon formte, sah ich schon was blinkendes im Overview, das mich aufschaltete. Statt also rauszuwarpen, schaltete ich ebenfalls auf, tackelte, webbte und warf die Drohnen raus. Gleichzeitig feuerte ich wahllos mit meinen Ion Blastern auf ihn. Glücklicherweise kam er in nächster Nähe raus. Und, was soll ich sagen. Er ging schneller down, als ich gucken konnte und explodierte kurz danach nur in einer wunderschönen Explosion. Im local gab der Pilot nur ein “LOL” von sich. Ich vermute, er war ebenso überrascht wie ich. Anders kann ich mir das nicht erklären. Seitdem hat es einige weitere Abschüsse gegeben, allerdings keinen Solo Abschuss . Ich hoffe aber, dass es noch den ein oder anderen geben wird. Ich werde es sicher weiter versuchen. Eigentlich wollte ich nun schon seit 2-3 Wochen einen Blogbeitrag schreiben, aber irgendwas kam mir immer dazwischen. Aber dafür kann ich nun ein paar Neuigkeiten aus New Eden zum Thema Citadels mit einflechten. Aber gut, ich fange mal bei den fails an..
Naja Lektion gelernt. Verluste abgeschrieben. Fürs nächste Mal muss ich also anders heran gehen. Außerdem sollte ich jeden Tag meine Mails kontrollieren. Kacknoob halt. Ok, kommen wir zu den spaßigeren Dingen. PVP macht mir tatsächlich Spaß und ich fange an mich in Corp und vor allem Ally tatsächlich halbwegs Wohl und Zuhause zu fühlen. Es gibt zwar noch das ein oder andere, wo ich meine Schwierigkeiten habe, aber man wird sehen. Mein Killboard hat zumindest mehr grüne, als rote Einträge, auch wenn das vermutlich eher den Fleets zur verdanken ist, an denen ich Teilnehme. Solo Fights gehen leider meist immer noch nicht so, wie ich es mir erhoffe. Ich tue mich immer noch sehr schwer dabei, zu beurteilen, was ich angehen kann und was ich lieber sein lassen sollte (und lasse es so meist von vorneherein sein). So oder so, ich freue mich auf die nächsten Wochen und Monate mit meinem Main im Lowsec, um mich in der Corp und der Allianz einzubringen. Ich bin gespannt, wann ich meinen Sec Status endlich unter 0 und dann endgültig bei -10 haben werde. Yay. Da ist es also, das neue Jahr 2015. Zeit zu rekapitulieren, was mich und meine Chars in EVE so bewegt hat. Es war ein bewegtes Jahr und ist ganz anders gelaufen, wie noch 2014 geplant. Ursprünglich wollte ich ganz viel Zeit und Engagement in EVE einsetzen, ja sogar für den CSM kandidieren, doch leider machte mir da eine Änderung der Arbeitssituation einen gewaltigen Strich durch die Rechnung, so dass am Ende sogar weniger Zeit, als vorher. Zusätzlich gab es diverse Umstrukturierungen. Der harte Kern der Corp wollte nicht mehr im Highsec rumdümpeln, sondern sich dem Faction Warfare anschließen und somit dem PVP widmen. Eine Richtung, die ich bisher gemieden habe, aber der ich mich nun auch anschließen wollte. Bald war eine Corp ausgemacht, in der ein Teil unserer Chars wechseln wollte, um das Thema anzugehen. Blöderweise war genau zu dem Zeitpunkt mein Job wieder sehr fordernd, so dass ich eine Zwangspause einlegen musste und nichtmals meinen Industriechar genutzt habe. Mittlerweile bin ich aber wieder gut dabei, sowohl was die Industrie, als auch das FacWar PVP angeht. Ich denke, die Zahlen übers Jahr können sich sehen lassen und auch wenn ich meinem Vorsatz, die 100 Mrd zu knacken nicht geschafft habe, bin ich, besonders mit der Tatsache effektiv vielleicht ein halbes Jahr gespielt zu haben zufrieden. Verloren habe ich im Jahr 2015 Schiffe und Ausrüstung im Wert von knapp 292 Mio ISK. Den Großteil hiervon mit meinem Main. Zusätzlich war ich mit meinen Chars an der Vernichtung von knapp 1,5 Mrd ISK beteiligt. Wobei ich dazu sagen muss, dass der größte Block hiervon bei der German Ganknight vernichtet worden ist. Ich bin zumindest gespannt, was das neue Jahr für mich bereit hält und hoffe, im Laufe der nächsten Monate mein Carebear Image ablegen zu können und mein Killboard mit dem ein oder anderen Solokill zu bereichern. ein gutes Jahr 2016 euch allen. Kidrob (der das Ganze wohl schon ein paar Mal veranstaltet hat) hat dabei einen grandiosen Job gemacht und es war faszinierend diszipliniert im TS. Was ich so von vorherigen GN’s gelesen habe, war das wohl nicht immer so. Los ging es für mich, nachdem ich mich noch mit einer Ferox und passendem Fitting ausgestattet habe in Ethernity, um von dort ins Low zum eigentlichen Zielgebiet nach Mya. Mein Puls war entsprechend hoch, da ich als Noob natürlich die ganze Zeit hoffte, nix falsch zu machen. Glücklicherweise waren die Kommandos von kidrob ruhig und gut verständlich, daher legte sich die Nervosität auf ein erträgliches Level. Es war schon ganz ansehnlich, als wir uns dann in Mya dann mit den Blinkys der Flotte zusammenschlossen und durchs System düsten. Ich liebe diese neuen Effekte einfach!!! Es folgte dann aber auch ziemlich schnell einiges an Action, da sich das System auf Grund der Trillionaire’s Xmas Party bald füllte. Wir brachten einige Schiffe zum Platzen und auch mein Sec Status bekam auf Grund diverser Abschüsse ein bisschen was ab. Gegen Ende wurden wir dann von einer Flotte Fleet Canes verfolgt, die sich unbedingt an uns laben wollte. Wir hüpften also von Position zu Position, um diese abzuschütteln und verloren auf diesem Wege diverse Schiffe. Da wir mittlerweile einige Stunden unterwegs waren, entschied sich kidrob dann dafür, unsere Flotte in Sicherheit zu bringen, da er uns nicht einfach so verheizen wollte. Und so beendete ich die Fleet auf Station, um mich dann am nächsten Tag, um diese Erfahrung reicher wieder ins FacWar Gebiet zu begeben. Ich hoffe, dass dies nicht die letzte Ganknight war und werde beim nächsten Mal sicher auch dabei sein. seine Eindrücke des Ganzen auch sehr schön geschildert.